Joe Grushecky  In March, CNN called him rock's "best-kept secret" and the network's broadcast piece featured him as part of their special on people who "just missed" becoming famous. This video segment was a run-up to the 2005 Grammy Awards where Bruce Springsteen took home an award for Best Male Vocal Performance on 'Code of Silence', a track that Joe co-wrote with the Rumson Rocker. Since the late 70's this Steel Town-based leader of the Houserockers has been forging ahead steadfastly molding a career through heat and sweat that many other performers would love to call their own. Joe Grushecky thanks the crowd for coming out following his second encore! Joe Grushecky and his band the Houserockers have been generating American blue collar rock with grit for more than a quarter-century now. Heralding from Pittsburgh, Pennsylvania Joe has released numerous albums that have received critical acclaim from industry publications such as Billboard and Rolling Stone. Despite that, the talented Grushecky and the Houserockers have yet to become a household name. Thus, Joe still has a job as a special education teacher in a tough urban neighborhood. Many of Joe's songs capture the authenticity of daily life for the working class. Grushecky also has a softer side penning songs about love and family. On July 24, 2005 Grushecky became the latest in a long line of talented musicians who have graced the stage at the Cupsaw Concert Series. It was a perfect day for a party in Ringwood, New Jersey as swans and ducks were on the water and birds were in the air. Excited guests arrived with food to share and fans got a chance to hang out on the deck over-looking the lake and they had an opportunity to meet and chat with Joe both before and after the concert. "I think tonight I'm going to tell a few stories about some of the songs," Joe said when he took the stage shortly after 5:30 p.m. Sitting with his black acoustic, Grushecky performed a solo set of fourteen songs and two encores that featured insight into the craft of songwriting and revealed some humorous moments that occurred while recording with The Boss. Grushecky has built a strong international following of dedicated fans and his most famous supporter has been his friend Bruce Springsteen. Together, they have written and recorded many projects since first hooking up on the Bruce Springsteen-produced American Babylon album which Joe Grushecky and the Houserockers released in 1995. "I had an opportunity to record with Springsteen in L.A., which is a cool thing," Grushecky began, relaying some anecdotes from the artist's first time working with Mr. Springsteen. "I mean, if you're a baseball fan you want to play with Mickey Mantle." In 1993, Grushecky was invited by Bruce to begin laying down tracks for American Babylon. He described how his real-world boss back in Pittsburgh got wind of the fact that he had been recording with The Boss in Los Angeles and he immediately prohibited Grushecky from doing so again  at the peril of losing his job. Clearly Joe was on the horns of a dilemma. Springsteen called soon after and Joe made the decision to call in sick in order to keep working on the record. Joe told the assembled that during this session with Bruce he was interrupted by his mom who was calling to tell Joe that work was looking for him. He then had to call his job to confirm his illness and he was told not to return unless he had a doctor's note. Grushecky finished this story, chuckling, saying "luckily my best friend is a doctor." Grushecky played three songs from the American Babylon period including 'Homestead'  which was his first co-write with Springsteen. Grushecky reported that he took this song's lyrics to Bruce and asked Springsteen to help him add some good music as Joe was unhappy with his own arrangement of the tune. Grushecky shared that he had an opportunity in 1980 to work with the legendary song-writer and guitarist, Steve Cropper [In the Midnight Hour & (Sittin' On) the Dock of the Bay]. "He happened to be a boyhood idol of mine," Grushecky said of Cropper, describing the session that resulted in his next song, 'Blood on the Bricks', a rendition that included thick leads, a foot stomp and the harp. "I was embarrassed to play guitar in front of Steve because he was that intimidating." Grushecky mentioned that he has been with a few record companies in his day and he joked that you can tell how bad business is going by how long they keep you on hold. He recalled one time when he phoned his label, and anticipating a long wait, he sat patiently strumming a guitar. "I sat with my guitar and wrote this love song while on hold," Joe said before playing 'All I Want From You'  a slow, sweet ballad about looking out for each other. "I told my wife I wrote it for her." Grushecky headlined the Stone Pony and the Cupsaw Concert Series in the same weekend! "This is the ultimate Pittsburgh song, if I do say so myself," Joe said before performing the crowd pleasing 'Pumping Iron' which is a tune telling the story of working class folk. The crowd seemed to agree, clapping along to the catchy, foot tapping tune. Grushecky followed this up with the touching 'Labor of Love' before changing the mood for 'Dark and Bloody Ground' with its harder vocals and furious (even on acoustic) guitars. 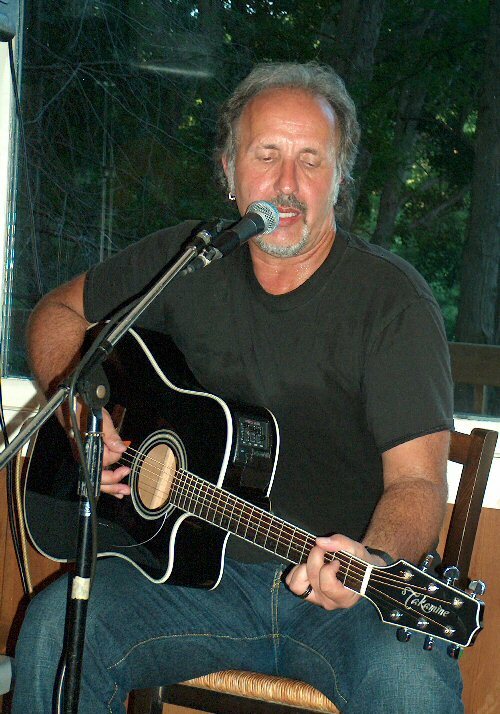 Joe thanked the audience for their attention and seemed to appreciate playing for a roomful of music fans rather than for a crowd at a noisy bar. Grushecky closed the set with 'Fingerprints' mentioning he knew he had a great song when he penned "lives weave together like fabric in a cloth." Following a standing ovation, Grushecky returned to the stage for encores of 'Talking To The King'  a rocking song based on an Elvis dream and 'Rock Ola'  a slower and more serious song about dealing with the day job. Throughout the show Joe played a diverse mix of songs from his vast catalogue. The night saw Grushecky playing strong rhythm on the guitar, foot stomping out tempos and providing a tuneful and animated harp. He also told his gathered fans to be on the lookout for the new "Demos and Outtakes" career retrospective 2-CD set that will be available soon. 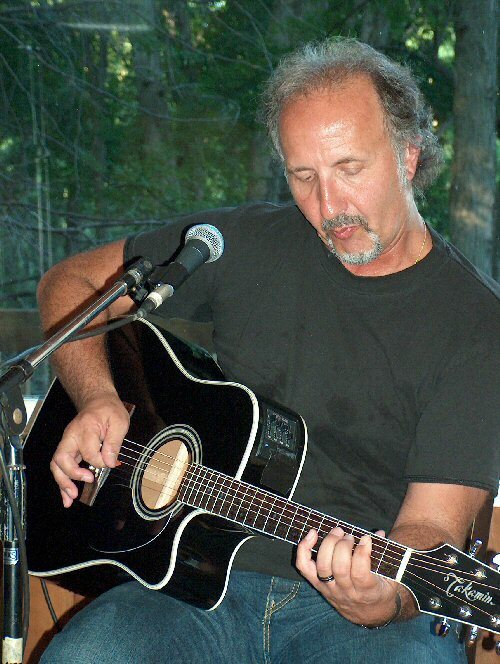 Joe Grushecky is an authentic, working class poet who composes music about daily life and its joys and sorrows. 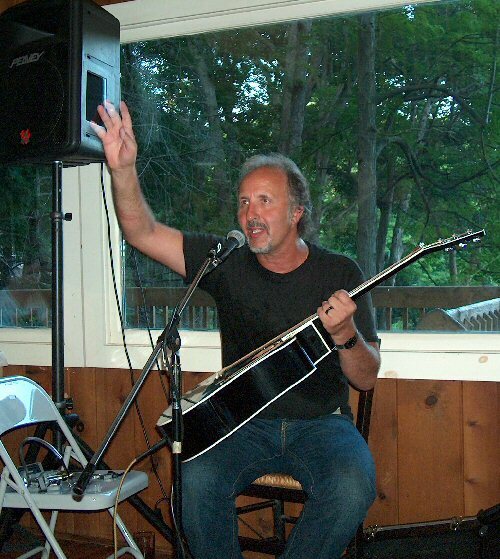 The house in Ringwood rocked thanks to Joe Grushecky and the hospitality of host Drew Eckmann. The Cupsaw Concert Series continues to draw music celebrity. Spotted in this evening's crowd was music manager and Light of Day concert organizer Bob Benjamin and Asbury Park's own Tony Amato, better known as leader and founder of the respected R&B/Blues outfit, "Bocciagalupe and The Badboys". Grushecky told a number of stories behind the songs at this show!